Planting tomatoes this spring is a great way to fill your refrigerator with juicy tomatoes all summer long. In the fall, you can turn them into salsa or sauce to use throughout the winter. Tomatoes do need some tender loving care to get them just right. Two important factors to consider prior to planting tomatoes are the soil and weather conditions. Tomatoes do better in direct sunlight. They also need fertilized soil or compost to flourish. You can purchase both organic soils and standard fertilizer at most garden stores. While there are soils marketed specifically towards tomato growing, these are not necessary. Choose varieties that grow well in your area. Choose varieties that will provide you with the type of tomato you want. Grape and cherry tomatoes produce small tomatoes and can be grown in containers easily. Plum or roma tomatoes are ideal for salsa and sauces since they contain more flesh. Beefsteaks are great for sandwiches all summer long. If you start from seeds, plant seeds in indoor potting starters at least two months before placing in a garden. Provide direct sunlight and keep seeds moist as they grow. They need warmth so consider using grow lights. To allow the plants to grow strong, run a flat hand across the top of them every few days to simulate wind. You should only plant tomatoes after the threat of frost is gone. Loosen soil prior to planting to allow for easy growth of the plants. If you are using plants you have started indoors, you will need to harden them to the outdoor climate. To do this, place the plants outdoors for several hours per day. Each day, lengthen the amount of time the plant stays outdoors by 30 minutes to an hour. Eventually, you can leave them out overnight. Bring them in if there is a threat of frost. If you have purchased plants from a garden store, do ask the center what type of fertilizer and soil were used. This allows you to create an environment in your home garden that the plants will respond well to. Once you have taken the time to grow plants to this stage, it is critical to give them a good start. The first thing to do is choose the right location in your garden. Keep in mind that some varieties of tomatoes can grow as high as four to five feet. Anything placed behind them will be shaded. They do prefer warm temperatures and direct sunlight. Use a cultivator to create a hole three to four inches in depth. Space out holes about 18 inches apart to allow the plants to grow and expand. Place the plant into the ground. Cover them with soil up to the top of roots. Give them a "hug" with your hands to plant them firmly. Do not push down hard. Ensure they are standing straight up. Do not disturb the root system. This will minimize shock. Plant the tomatoes in rows for easy access. Leave a path that is walking width apart to ensure you can reach the plants. 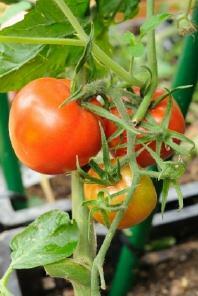 Throughout the growing season, you will need to come back into the plants to tie them up or to pick tomatoes. Planting tomatoes is only complete once you water them. Soak them well for best results. After a few days, depending on the quality of the soil you have used, you can add a fertilizer. Choose those products designed for tomato use. Even better, you can select a compost material for around the base of the plant. Keep tomatoes watered. While the top layer of soil can be dry, you want the soil near the roots to stay moist throughout the growing season. Keep tomatoes upright. Use a mesh tomato tower to do this or just use a tomato stake. Tie the plant's centermost stem to the post and allow it to grow upright against it. What you will find is the tomato plants do well even if you forget about them. Allow tomatoes to ripen on the vine for the best results. You should get multiple harvests from your plants throughout the summer months. Planting tomatoes is a great way to have a healthy vegetable on your table all summer long.